These extraordinary photos show a bonobo – also known as a pygmy chimpanzee – named Kanzi collecting wood, breaking it up and putting it into a pile before striking a match to light the fire, and then cooking his meal on the fire. BUSH RIDES WITH WOUNDED WARRIORS..
That’s nothin’. WE got the same problem at the White House..
From what I’ve read, them ain’t the only KNOBS, he’s licked and infected..
By the way, Good Onya’, mate. Well, umm, maybe NOT the Chinese part.. 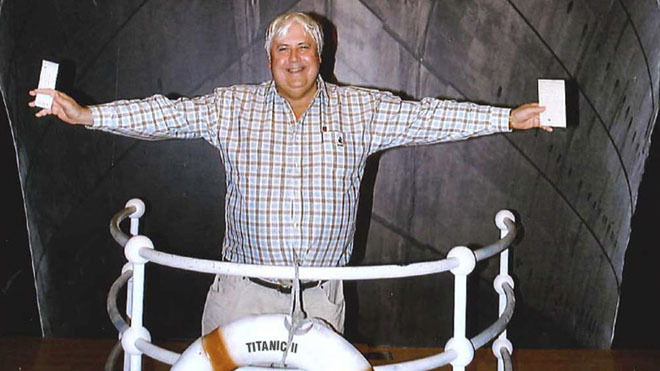 In this April 25, 2012 photo provided by Crook Publicity, Australian billionaire Clive Palmer poses in front of an artist impression of the Titanic ll at MGM Studios in Los Angeles, Ca. Palmer said Monday, April 30, 2012, that he’ll build a high-tech replica of the Titanic at a Chinese shipyard and its maiden voyage in late 2016 will be from England to New York, just like its namesake planned. Original, ain’t they? Our country KNOWS which way to move, sell that to YOUR Friends of Islam, Team #44! Ripped from the headlines of …. MSNBC. Right on target, Representative West..
You know, if people NEED a “social network” as those listed below, YOU AIN”T got much “social” and you sure as hell don’t have a life!